Blessed thistle is an annual flowering plant that originated in the Mediterranean region and is now found in other parts of the world, including Europe, Asia, South Africa, Central and South America, and it is scattered across the U.S. and Canada. Blessed thistle was traditionally used in bitter tonics to stimulate appetite and digestion, among other potential uses. Common preparations of blessed thistle include as a tea, in dietary supplements (usually in capsule form), in herbal tinctures, extracts, or flavorings for alcoholic beverages, such as Benedictine liqueur. Gastric irritation and vomiting have been reported from high doses of blessed thistle (>5 g per cup of tea). May cause allergic cross-sensitivity with other members of the Asteraceae family. Do not take if you are allergic to ragweed. Not safe for use during pregnancy. Not recommended in infancy or early childhood. There is no widely accepted standardization for blessed thistle. Always consult with your healthcare provider before taking an herbal supplement. 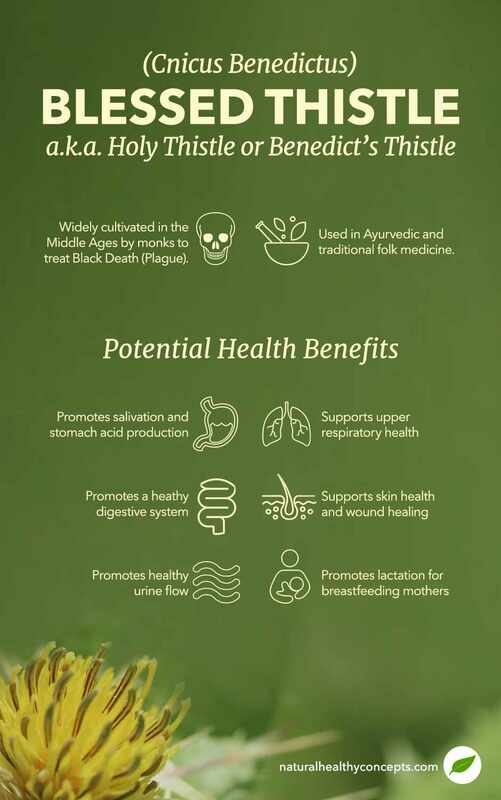 Blessed thistle has been used for more than 2,000 years to stimulate appetite, support bile secretion, support liver health, support circulation, promote hormone balance, and more. Historically, herbalists used blessed thistle as a general stimulant and as a tonic to support the digestive tract. Bitter herbs such as blessed thistle help stimulate organs into a reflex action, especially in the liver and female reproductive organs. It also has an expectorant effect on the upper respiratory system, which may temporarily ease symptoms related to seasonal health challenges. Preparations of blessed thistle have been used historically as a general tonic/cure-all, according to the Natural Standard Research Collaboration. The flowering tops, leaves, and upper stems of blessed thistle have been used in various herbal remedies since the Middle Ages, as well as in Indian Ayurvedic medicine and traditional folk medicine. In vitro studies suggest a broad spectrum of antimicrobial activity of blessed thistle. However, not enough is known about the safety or efficacy of the plant, according to the Natural Standard Research Collaboration. Warning: Herbs such as blessed thistle or fenugreek that are used to stimulate lactation are also uterine stimulants, which may cause a miscarriage, so they should not be used during pregnancy. Other common herbs used as galactagogues are stinging nettle, goat’s rue, fennel, shatavari, or alfalfa, but caution should always be used. Herbal galactagogues may interfere with other medications or cause reactions, so it’s important to talk to your healthcare provider before use. Are you a nursing mother? Don’t feed your baby commercial baby formulas that may have GMOs! Instead, try herbal galactagogues such as those made with blessed thistle as a natural way of promoting the production of a mother’s breast milk supply. Or, if you need digestive support, help healing minor skin abrasions, temporarily relief of symptoms related to seasonal health challenges, or need an appetite stimulant, try blessed thistle in supplement or herb form as a tea or poultice.